7-year old Angel was accepted into our rescue in February 2008. Surrendered by her 82-year old "dad", Angel's bleeding hot spot on her tail turned out to be a lot more serious than he thought. It wasn't a hot spot at all - her entire tail was dead and would need to be amputated. Facing some health issues of his own, he was unable to afford the pre-surgical testing and subsequent surgery, so he immediately signed her over to rescue and her medical care began. Blood work and x-rays revealed that she was healthy enough to undergo the surgery but a course of antibiotics was to be administered first to try and bring the infection under control. 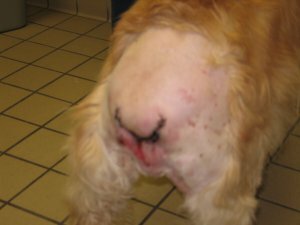 However, by the next day the tail started to crumble and break down, so her vet recommended that she immediately be transferred to Garden State Veterinary Specialists so she could be examined by a soft tissue expert. Angel was transferred that afternoon, and by that evening she was in surgery. Her entire tail was removed right up to her coccyx. She continued with pain meds, antibiotics and IV fluids, and throughout it all, her Golden smile remained. Angel remained in the hospital for several days and was visited by several GRRI volunteers. Because the infection was so severe, there was a 25% chance that there would be some lingering infection and it could abscess. And that�s exactly what happened. Angel had to undergo surgery once again to drain a large abscess that occurred on her left flank. After several more days in the hospital, she was released into the care of one of GRRI�s foster homes. Warm compresses were applied to the area several times a day; antibiotics continued, and she had frequent check-ups with the vets at Garden State. She was receiving a lot of love and attention in her foster home and things were looking up. In March she needed to be transferred to a second foster home because of a family situation that came up in her first home. In late March her foster mom reported that she wasn�t putting weight on one of her rear legs. 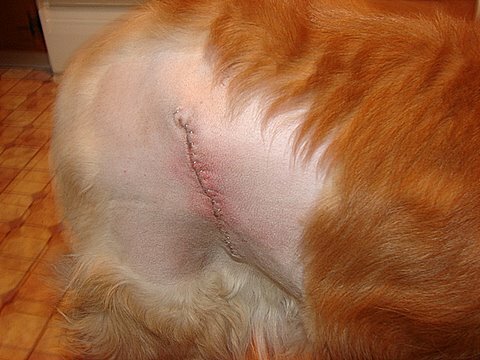 Angel had a torn cruciate ligament, so once again she underwent surgery to stabilize the knee. The surgery went well and was sent home with instructions for slow leash walks, no rigorous exercise, no jumping and limited number of stairs to climb. Just when we thought she was ready to go to her forever home, another medical condition seemed to be brewing. Her veterinarian recommended that she be tested for Cushing�s Syndrome, aka Cushing�s Disease. Simply stated, Cushing�s is caused by an overproduction of Cortisol (cortisone), a hormone produced by the adrenal glands. The adrenal glands are located on top of the kidneys. Cortisol is released in times of stress to help the body prepare for �fight or flight� responses. If the body is exposed to this hormone for a long period of time rather than just during stressful periods it can be very debilitating. Once Cushing�s is properly diagnosed it can be controlled with medication but it cannot be cured. Angel began a series of diagnostic tests on May 26. On June 11th we were thrilled to learn that she does not have Cushing�s. Angel�s on-going medical care has been paid for through GRRI�s Joann Smith Memorial Fund (JSMF). This is a special fund set up in memory of one of our volunteers, Joann Smith. Its purpose is to provide extraordinary veterinary care to the Goldens entrusted to us until we can place them in their forever homes. This fund is made possible by fundraising efforts, through memorial donations and through designated special gifts. GRRI would like to thank all the volunteers who were a part of Angel�s �rescue�; to the volunteers who kept her spirits raised while she was in the hospital, and especially to both of her foster homes who have been providing such excellent care. We�d like to thank all the people who have made donations to the JSMF so that we can give Angel the care that she needs. It�s our goal to never have to say we can�t afford to provide the care that is needed to any of the Goldens in our care. 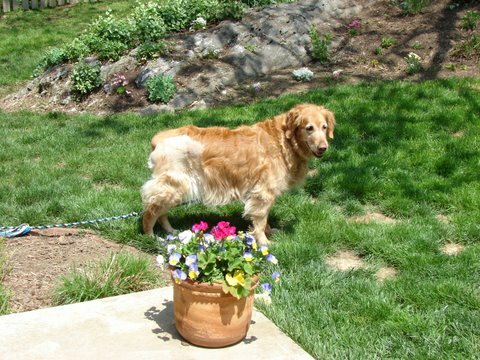 Angel is a gentle, lovable Golden who loves everyone she meets. 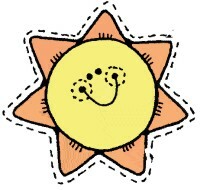 She hasn�t let life get her down, and is living each day to the fullest. She is a shining example of why we love this breed so much. 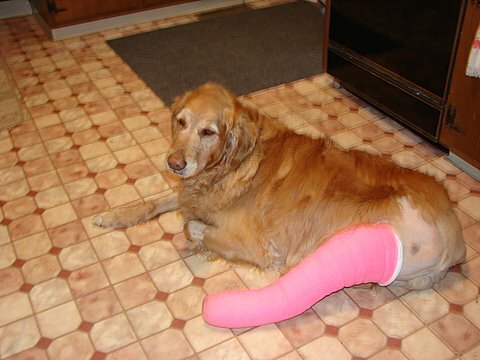 Please help us continue to help her and other Goldens like her.